OSLO, Norway – 22nd March 2018 – Vivaldi and DuckDuckGo collaborate to reclaim privacy for users on the Internet. 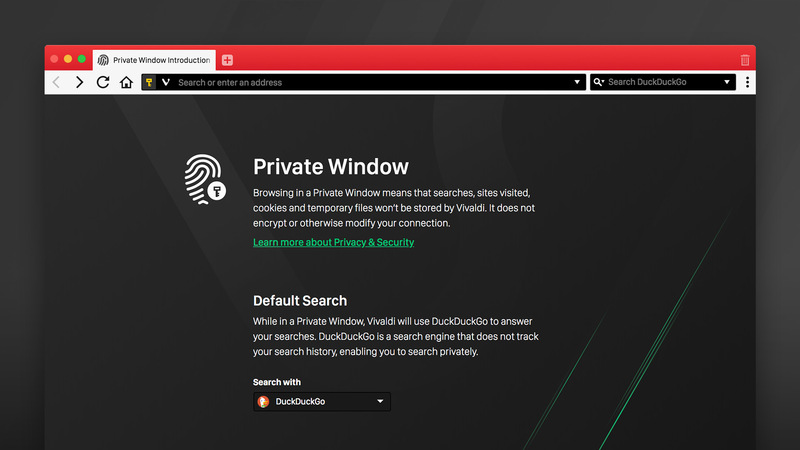 Today, Vivaldi becomes the first browser to enable DuckDuckGo as the default search engine in its Private Windows. Opening a Private Window in Vivaldi allows users to browse in a more secure way. This means sites visited, cookies and temporary files will not be stored. When users open a Private Window in the latest version of Vivaldi, they will find DuckDuckGo as their default search engine, unlike in other browsers. They can now enjoy seamless browsing in a private mode while also keeping their searches private. With this integration, Vivaldi continues to put the privacy of its users first as one of its highest priorities. It does not track or gather any private information of its users. “We believe privacy is a fundamental right and that users should not be tracked online or offline,” says Jon von Tetzchner, CEO of Vivaldi Technologies. A recent DuckDuckGo survey illustrates how privacy is becoming a mainstream concern in the U.S. with 24% of U.S. adults taking significant action to protect their online privacy. Unlike other search engines, DuckDuckGo does not collect or share personal data of its users. Side Panel with easy access to bookmarks, downloads, “tree-style” tab manager, notes, browsing history and websites of users’ choice. Powerful History overview that lets users explore their browsing patterns.